Yes, some parents give their children a house without a mortgage. The home may be a former rental property or it may be the family home that the parent no longer needs. A new or, more likely, a used car is a rite-of-passage gift that the child may receive upon getting a driver's license or graduating from high school or college. If parents buy a car for a child, they may also pay car insurance, taxes, and expenses to maintain the vehicle. Grandparents may pay the private-school tuition for their grandchildren. When the kids are ready to buy a house, parents may give them the money for a downpayment. Parents may allow children to stay in their vacation homes. They may pay the lodging bill and other expenses for a vacation with the extended family. If children work in jobs without healthcare benefits or they are still in college, parents may keep their children on their healthcare insurance plan at work until the child turns 26. Parents may include their children on a cell phone plan long after they've graduated from high school or college as combined family plans may (seem to) save money for everyone. Parents may give cash or stock gifts to their children or grandchildren on special occasions or yearly as a family bonus of sorts. To help launch a child into the real world, parents may fund a business start-up or help them get established in a new city, supplying cash for the move, deposits, furniture, and appliances. Parents may give their kids money designated for rent, utilities, clothing, groceries, etc. or just pass along cash for general living expenses. 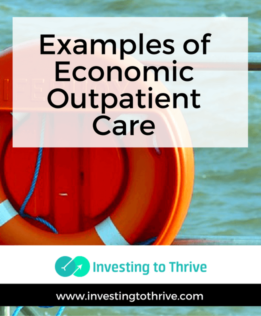 After reading this list, I can see that there are many ways to give and receive economic outpatient care. I acknowledge that — for legitimate reasons — I may want to give money to my kids or accept gifts from my parents (or vice versa as grown adult children may help their parents). I shouldn't feel guilty, for example, for receiving and accepting an invitation to stay with family members at their beach house or lake cabin. But if gifts are skewing a sense of what's affordable and what's not, and possibly preventing someone I love from developing sustainable financial habits, then it may be time to reevaluate economic subsidies. You want to give your children your best, which means not giving them everything. Get affirmation that you're making the right decisions by reading The Millionaire Next Door.